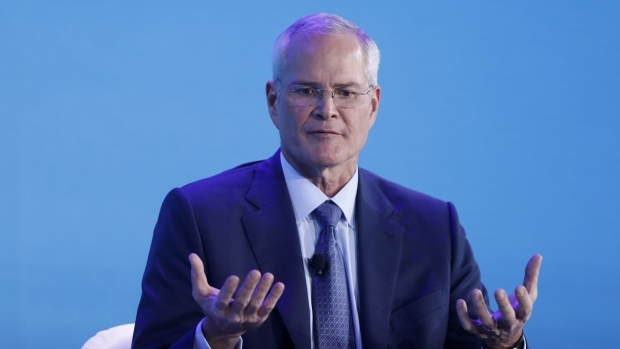 Darren Woods is about to do something no Exxon Mobil Corp. (XOM.N) chief executive officer has done in at least 15 years -- he’s going to speak to analysts on an earnings conference call. On Friday, Woods will break with the company’s longstanding tradition and speak about fourth-quarter results. The reason for the change of heart is clear: Exxon dropped 18 per cent last year, its worst annual performance since Ronald Reagan became president in 1981, chiefly due to major earnings and production misses. Earnings days have been particularly bad -- shares of the Irving, Texas-based company have dropped after three of the past four quarterly releases, including a 5.1 per cent plunge last February. Woods’s predecessor, Rex Tillerson, never spoke on these calls during his 11-year tenure. The current CEO had been following that lead, talking to Wall Street at the company’s analyst day and giving some industry speeches while leaving the earnings calls to an investor relations representative. But after signs that analysts would no longer be happy seeking explanations from lower-level executives, Exxon announced last year that Woods would speak on the fourth-quarter call and that top lieutenants would take questions about the other quarterly releases. Only a third of analysts covering Exxon rate the stock “buy,” making it the least favored among Big Oil rivals, according to data compiled by Bloomberg. The CEOs of Royal Dutch Shell Plc, BP Plc and Chevron Corp. speak on their earnings calls. In July, Senior Vice President Neil Chapman called the second quarter “a low point” for production, so investors and analysts will be looking for improvement for the remainder of 2018. On Thursday, Woods announced a major restructuring of the division, designating three units: operations, technical support and strategy, which includes mergers and acquisitions. The company is investing in massive new projects from offshore oil in Guyana to liquefied natural gas in Mozambique to replace its rapidly declining base production, made worse by the Netherlands’ decision to close Europe’s largest gas field, in which Exxon has a 50 per cent stake. Analysts are forecasting net income of US$5 billion for the quarter, a 40 per cent drop from the prior year. Quarterly profit has recovered from a low of US$1.7 billion in 2016, but is still well short of the record US$15.9 billion reported in 2012, almost half of which came from asset sales. Exxon flagged a significant hike in capital expenditure this year from last year’s expected US$24 billion to pay for its major projects. Analysts will be looking for exactly how much Exxon plans to spend. Gabelman expects around US$28 billion. Analysts are split on whether Exxon will join Royal Dutch Shell Plc, Chevron and Total SA in committing to a share buyback. Barclays and Berenberg reckon it’s unlikely given capex plans, but HSBC Holdings Plc and Raymond James Financial Inc. say it’s a possibility.